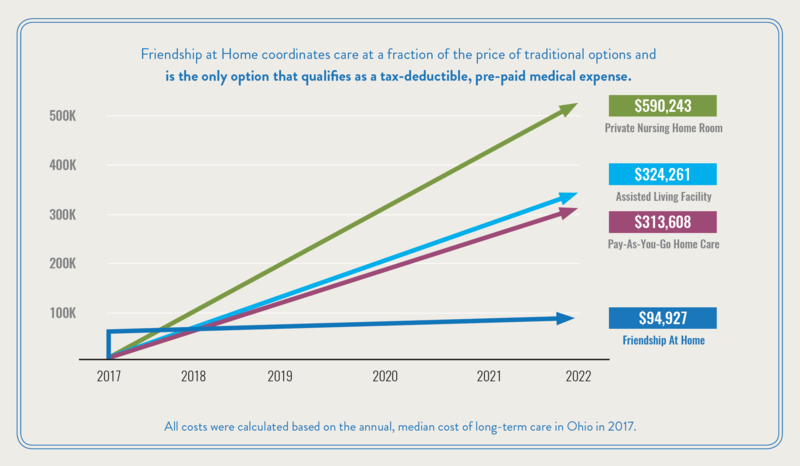 To the surprise of many, Medicare and private insurance rarely cover the costs of home care services like long-term live-in aides. Not to mention the hassle involved with finding and scheduling the right care providers when you need them most. Friendship at Home is a unique option for those who want to age at home with the peace of mind that there is a plan in place for home care services. Our program makes in-home care affordable and coordinates services whenever you need them. In fact, with a one-time membership fee and a small monthly payment, Friendship at Home provides the same peace of mind as traditional options like private nursing homes, assisted living facilities and pay-as-you-go homecare — but at a fraction of the price. Give us a call at (614) 734-2167 to speak to our team about the different options Friendship at Home offers. We are happy to answer any questions you might have!